This Sunday at 4am, five teenage members of a motorcycle gang attacked an inebriated man, reports The Korea Herald. Seoul police think that the teens were copying a scene from Grand Theft Auto IV. The 31 year-old drunk man was sitting on the curb in southern Seoul when the gang assaulted him. Authorities filed for arrest warrants for two of the five teens; the other three are already in police custody. 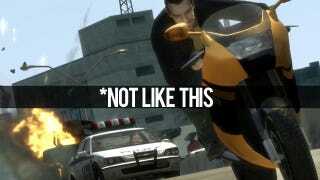 As The Korea Herald points out, GTA IV has vehicles, including motorcycle bikes, as well as guns. None of the teens had firearms. GTA, of course, is a favorite boogeyman to pin crimes on. The Korea Herald does not go into detail as to why authorities think this attack was an attempt to "copy" a GTA IV scene—you know, the one in which a group of young punks attack a drunk guy sitting on the curb. Surely you remember that mission? No?